What is your luxury oil? Here at MMS we have a great technical support team. They are able to answer all of the questions a soap maker can have about what went wrong or right with their batch of soap. When you are starting out, all of the information and lingo can be overwhelming, so we are here to make it easier and fun! During the next two weeks, we will be covering a lot of information and recipes perfect for newbies or those who have been struggling with soap gremlins ruining batches. If you are new or are just at the end of your limit, email us with your questions or concerns! We will try to cover all of your questions in this series. We are here to help! Today we are going to start with discussing our 6-5-4-1 Formula. This formula is really a set of guidelines and it is great because it helps create a fool-proof batch. The 6-5-4-1 formula will have a total of 1 lb in oils. If you follow the basic rules for our 6-5-4-1 soap formula, you will get a hard, lathering bar every time! Let’s start with the 1 oz of oils for our soap batch. This will be our luxury oil. There are a lot of luxury oils out there. Shea Butter, Avocado Oil, Cocoa Butter, Lanolin, Peach Kernel Oil and Seabuckthorn Oil are just a few of the many options. When choosing your luxury oil, one of the big questions you need to ask yourself is “Why am I making soap?” You will choose different luxury oils if you are making soap for yourself, family and friends or if you are making soap to sell. When making soap, your luxury oil needs to be targeted to the audience you want. It can be hard to limit yourself to just 1 oz of luxury oil but stick to 1 oz. Why? If a little is good, isn’t more better? No, high amounts of certain luxury oils can cause things like DOS (dreaded orange spots), lack of lather, soft bars or even sticky, gloopy messes. 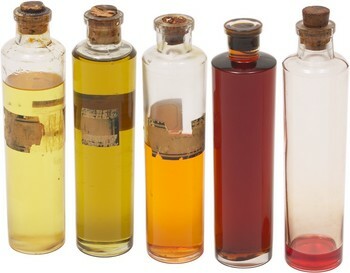 Luxury oils are also just what they are called, they are luxury items. This means there is a limited amount of the product in the world. Yes, you can make a soap using only Shea Butter but it is not cost effective and the practice isn’t sustainable. We can all contribute to “going green” by keeping and using luxury oils for what they are. Our next number is 4. I prefer to use something that provides small, dense lather. Olive Oil is a good choice here. It will contribute great lather without making the bar too soft. Soaps that have a high amount of Olive Oil take a long time to cure and as a general rule, are very soft. Other oils that contain high oleic fatty acids will be good alternatives to Olive Oil. Some of those alternatives can Rice Bran Oil, Sunflower Oil, Peanut Oil and even Safflower Oil. Next on our list is our number 5. For our number 5 oil, we need oils that contribute to large bubbly lather. Things like Coconut Oil and Palm Kernel Oil fit the bill. Number 6 is our foundation oil. Now you may be wondering why we didn’t start with the “foundation” oil first. When building a house, you need to start with a foundation but you also need to know what cabinets you are going to put in the kitchen and where the bathroom will be located. If the foundation/floor plan and the cabinets don’t work together, you get frustrated, annoyed and even angry. Let’s try to prevent that by having the whole work together well from the start. For the foundation, we recommend you use easily available oils that create a nice hard bar. Things like Hydrogenated Soybean Oil, Lard, Tallow and Palm Oil are all easy-to-find, inexpensive oils that make wonderful hard bars of soap. The oils that make the best foundation are solid at room temperatures. During the next two weeks, there are two pieces of equipment that are vital to making soap. The first one is a good scale. Great soaps have their oils weighed out. They are never measured by volume. The other thing you will need is an instant read thermometer. A surprising number of batches that fail are due to temperature problems. If you have any questions you want covered during the next two weeks, leave us a comment or email us! We will do our very best to help you. We want you to succeed so you can truly enjoy the process of making your own handmade soap. Thank you x a million for doing this series!! I have just begun soaping, and I am always wondering why a certain oil is in a certain recipe, and just how much can I tweak things before a batch is ruined! Welcome to the fun Karen! If you have questions or concerns, let us know. We are here to help! I am going to use these ratios for jewelweed soap. The jewelweed tea is cooling on the stove. It smells lovely. Wish me luck. Can you mix essential oils with fragrance oils? Absolutely! One of my favorite blends is Icy Water and Peppermint! The sky is the limit! Being lost is a normal feeling when starting any new endeavor. At times ignorance is quite helpful in helping us start new things – we didn’t know enough to stop ourselves. Other times ignorance is a roadblock. When we get worried that we don’t know enough to start then we freeze. Our site and our technical support staff are here to help remove the roadblocks. Let us know what ingredients and tools you have collected. We will try to make this easy for you. How do I find the rest of this series?? I’m having trouble.